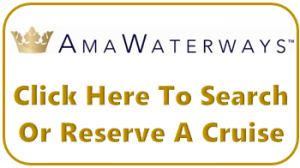 AmaWaterways operates a rapidly-growing fleet of intimate-size, custom-designed ships, providing all-inclusive river cruise vacations on the great, scenic waterways of Europe, Asia and Africa. Inspired by luxury yachts, AmaWaterways ships carry an average of 150 passengers each, in unequaled comfort and style. Staterooms are spacious with French balconies or Twin Balconies to capture passing views. On select vessels, staterooms have connecting doors to accommodate family and group travel. Vessels dock in the heart of each destination—so guests can walk ashore. Shore excursions in every port are included the cruise fare, along with bicycles for individual exploration and guided bike tours. The all-inclusive fare also covers cabin crew gratuities, complimentary ship-wide Wi-Fi, unlimited wine during lunch and dinner, specialty coffees and teas, and bottled water replenished daily in staterooms. The state-of-the art fleet offers every modern luxury of a top-rated hotel, including palate-pleasing culinary experiences. AmaWaterways’ expert chefs craft menus that feature exquisite, locally-inspired cuisine as well as traditional, Western offerings. Executive Chef, Primus Perchtold, the winner of three gold medals at the European Championship of Culinary Art, oversees menus aboard European cruises. The Chef’s Table, an exclusive specialty dining experience, available as an option on all ships, is included in the cruise fare. It is the only venue of its kind in river cruising. And, AmaWaterways is the only river cruise line ever inducted into La Confrérie de la Chaîne des Rôtisseurs, a prestigious international gastronomic society dedicated to fine cuisine. In its definitive guide to river cruising in Europe, Berlitz rated AmaWaterways ships the highest of any river boats, further enhancing the line’s reputation as the leader in river cruising. An AmaWaterways voyage is about more than the destination – it’s the journey; a way to see the world in luxury and comfort. Since 2002, AmaWaterways has earned a proud reputation as the premier river cruise line operating on the world’s most scenic waterways. With a trio of passionate travel industry pioneers at the helm, our custom-designed ships, high-end amenities, impeccable service and expertly guided shore excursions offer guests unparalleled comfort, convenience and style. We offer friendly and knowledgeable service during every step of the trip. Our highly-trained and professional Cruise Managers provide the best in service during cruises and land programs, ensuring a uniquely personalized experience for guests. modern luxury of a top-rated hotel.